Let’s talk about football. And to clarify, I do not mean soccer but the iconic American sport were full body-contact and intense fan-chanting are in the center. While I have neglible interest in sports I wanted to give it a shot and experience how a game feels like. 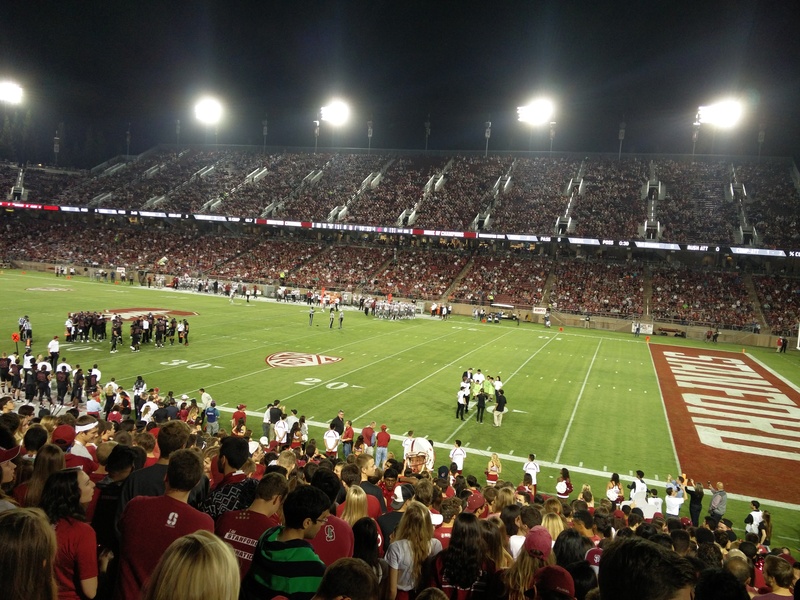 Stanford has its own sport teams in multiple disciplines which participate in regional and university leagues. Our team is famous enough to draw in fans from the surroundings who have no affiliation with the university. With labmates I got to watch my first football game, the match against Washington State University on Oct 8, a home game. Students are eligible for free entry tickets to home games of our teams and have their dedicated section were everyone wears Cardinal Red shirts, hence the “RedZone”. Before the actual game starts fans meet up for “tailgating”. On the parking lots near the stadium people grill and drink a lot to prepare for the game. They tend to do this three hours before kick-off! When we entered the stadium my first thought was how large it was. Before kickoff the home band and cheerleaders pumped up the crowd. Suddenly everyone was pointing and looking towards the sky. Up in the night sky I saw a sparkling light, then a second and a third. As they approached the silhouettes turned out to be parachuters – the Leap Frogs to be exact. 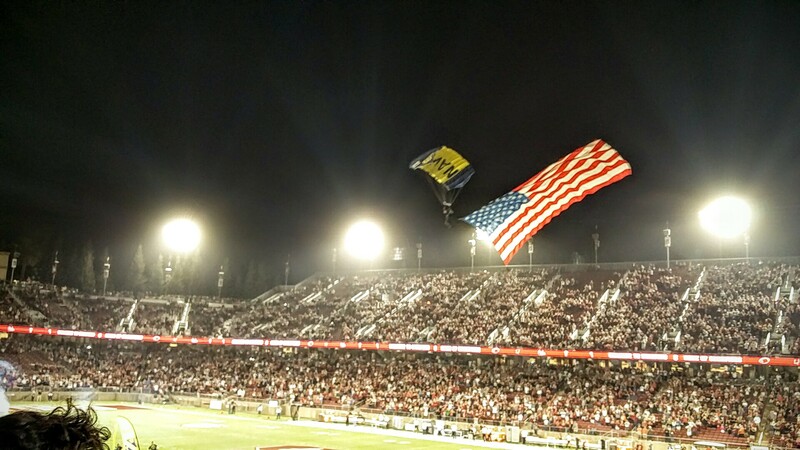 The Navy parachute team delivered the flags of the both teams followed by the national flag. 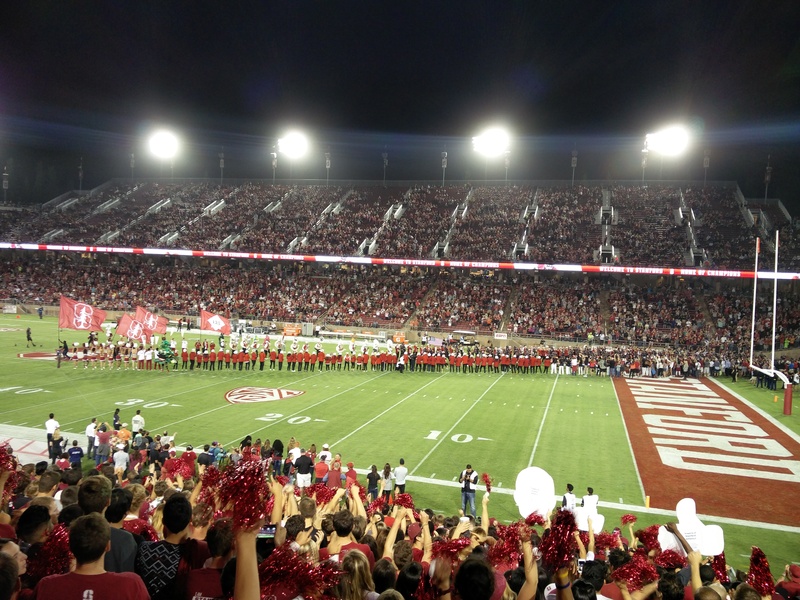 We could hear the Stanford band from 5,000ft up as we parachuted in. In contrast to the exciting prelude the play was rather plain. 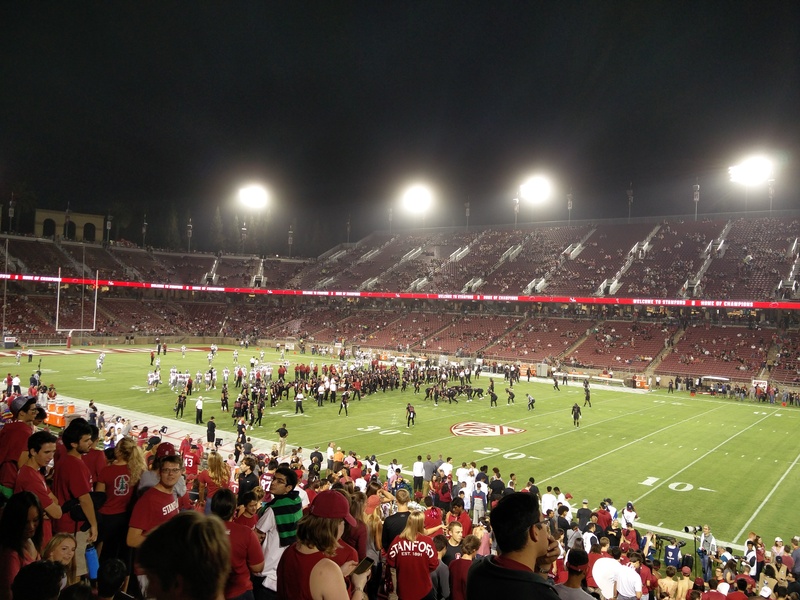 Stanford played not very good though they did well in the last few games. Even though the situation began to look dire the crowd, band, cheerleaders and the announcer made sure to cheer for their team as they were bringing home victory. I had no idea about the rules or play strategy of football so it does not come as a surprise that I could not follow the game development well. Still, why is the game interrupted for minutes every other minute? Because of the immense length of these micro breaks the broadcast of the game includes frequent advertisements. Now I began to understand why the Superbowl ads are the most expensive and most viewed ones in the US. Another quirk I did not get was the replacement of the complete player team on the field during multiple micro breaks. Apparently the teams consist of offensive and defensive sub teams. This way the first half with a play time of 30 minutes ended after 1.5 hours. I decided to leave the game at that time. Apparently the match went even worse in the second half. Football is really a strange sport I have to say. Nevertheless, it was fun to watch and see how it compares to German soccer. I think I might come to see another game at some day.